Celebrating the fantastic females who changed history, this reference book for children tells the intriguing life-stories of Joan of Arc, the Suffragettes, Rosa Parks, Oprah Winfrey, J.K.
Rowling, Malala Yousafzai, and more. Super scientists such as Marie Curie, clued-up creatives like Emily Dickinson, sporty successes such as Serena Williams, and political pioneers like Angela Merkel all feature in 100 Women Who Made History. You'll discover how Ada Lovelace became the first computer programmer and how brave Harriet Tubman helped enslaved people escape to freedom. Featuring beautiful photographs, engaging text, and zingy illustrations, this book takes readers on a rollercoaster ride through women's history, from Ancient Greece right up to the modern day. 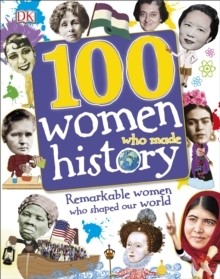 Showing that it's not just a man's world, 100 Women Who Made History is a children's history book that is for anyone who wants to get the inside story on how women have shaped the world we live in.